Hop Farm Field Trip — The Phoenix Brewing Co. Wet hopping a beer means to use a hop directly from the bine without any processing. Wet hopped beers are fragrant, more aromatic. and the flavor seems a little grassier or greener to the tongue. They scream summer and freshness. And even though summer isn't even close to it's end, the hop harvest is here with a very short window to use hops at their peak before processing. For 2017, our Barb Doe Rhubarb wheat will be brewed with all Ohio ingredients. 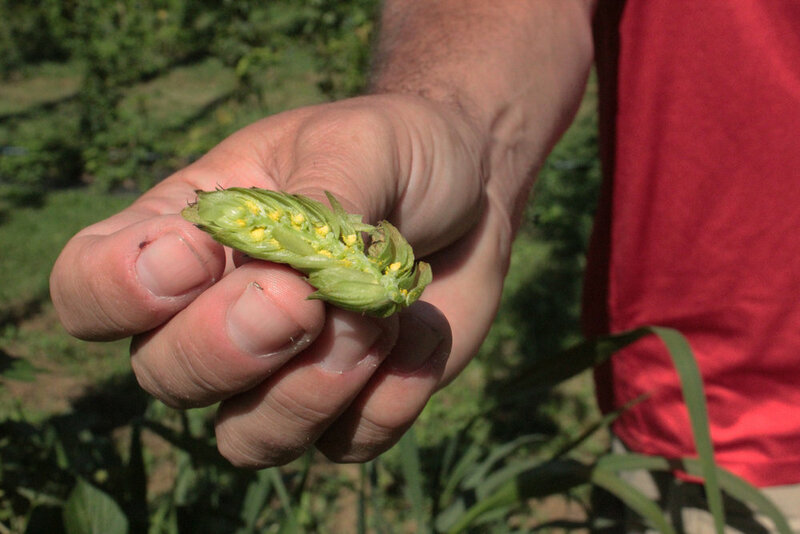 We wanted to learn a little more about where the hops were coming for this special beer. So about 10 of us from the Phoenix took a field trip to the For the Love of Hops hop farm in West Salem, Ohio. Patty and Mike Roberts, owners and farmers were gracious hosts and full of hop knowledge. Upon driving up to the hop yard, we were first met with row upon row of towering hop bines supported by re-purposed telephone poles. 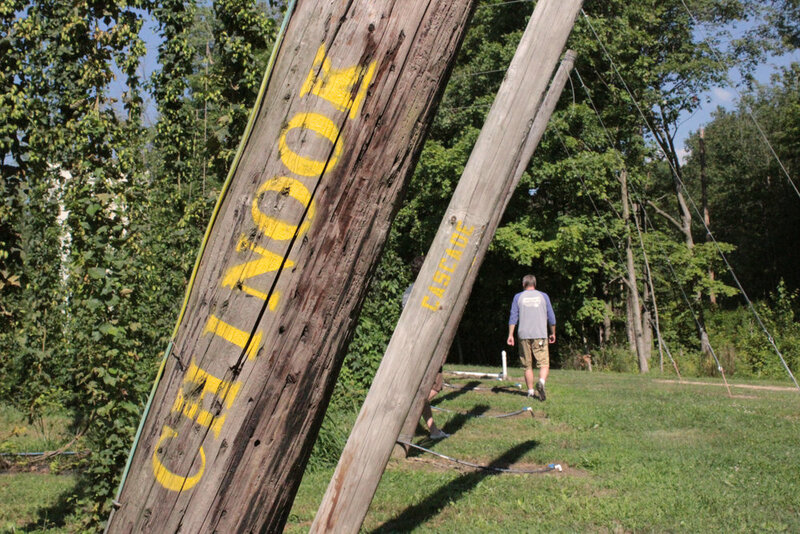 Each different hop variety was marked on a tilted pole identifying the row. It was impressive to walk through the long rows of hop bines, almost like tall outdoor corridors. The hops are watered with a gravity fed irrigation system sourced from collected rain water. The ten of us spread out and wandered through the hop yard comparing the hops and their aroma, shape and size. Some were longer, some were more pungent, but all were perfect to pick a few and try out in a pint. After exploring, we returned to the barn to pour some Redemption IPA and infuse it with fresh Cascade hops. We continued our hop education by sampling the differences in the Pale Ale 419 and Garuda Gose with fresh hops. Field trips like this provide an opportunity for a fun and educational experience. If you missed your shot this year at trying some of the fresh hops dropped directly into your beer, you can still try our All-Ohio brewed Barb Doe which releases on August 30th. With locally sourced rhubarb, hops from For the Love of Hops, and barley recently malted from Haus Malts in Cleveland, it is one of the freshest drafts in town. Slightly tart and definitely a treat. Sign up with your email address to receive monthly news and event updates.